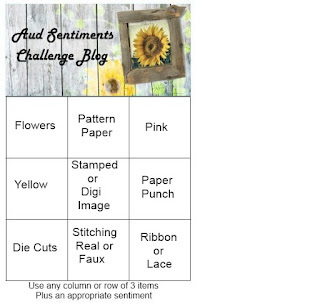 The theme at Aud Sentiments is a bingo challenge this time. 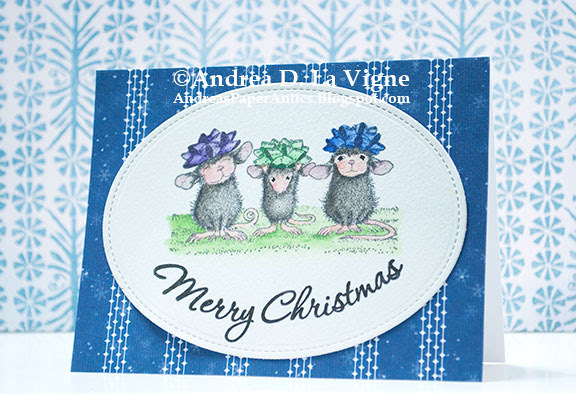 I used the middle column for my card: pattern paper, stamped image, & (faux) stitching. I also used the sketch from Christmas Card Throwdown for my design, rotating it 90 degrees to be horizontal. I began by die cutting an oval from 140 lb. watercolor paper with a Lawn Fawn "Small Stitched Oval" die. I curved my greeting, from Hero Arts "Very Merry Christmas" (discontinued) to fit the curve of the oval, and stamped it with Versafine Onyx Black ink onto my oval. Because the image I chose (Stampendous "Bow Tied") is a rubber stamp, I used my Stamp-a-Ma-Jig to help me position it. I marked the vertical center of the oval, decided where I wanted the baseline of my image to be, and marked that with a light pencil line as well. After I stamped my image onto the clear plastic sheet of the Stamp-a-Ma-Jig, I used that to position my stamp, and stamped with Hero Arts Charcoal ink. I colored the image with my Inktense pencils, using a damp paintbrush to pick up the color from the pencil and apply it to the paper. When I had finished, I used my clear Wink of Stella shimmer pen to add some glitter to the bows. Those are very fetching hats, beautifully coloured and the curved greeting is very effective.